In general we lack a mindset in personal safety and/or proactive and safe approach towards our personal and/or family health and safety issues like first aid training requirements. Basic and Emergency First Aid is mandatory in USA, Europe, Australia, Canada and other developed countries. In recent London Olympics more than 2700 First Aiders volunteered their services but in Pakistan we hardly get few hundreds of first aiders in cities like Karachi, Lahore and Islamabad. This is because here in Pakistan people fear police case as a result of performing first aid in an emergency so they don’t step up to help others which is really alarming. We can manage this fear by spreading this information to help all Pakistanis to understand more about the legal support offered to them by the national law and one provincial law (by Punjab province). Below is the extract from the article written for The Express Tribune on June 15, 2014. Time is of the essence when it comes to treating a gunshot wound. Kindly visit below link to read full article, Bite the Bullet, on The Express Tribune. 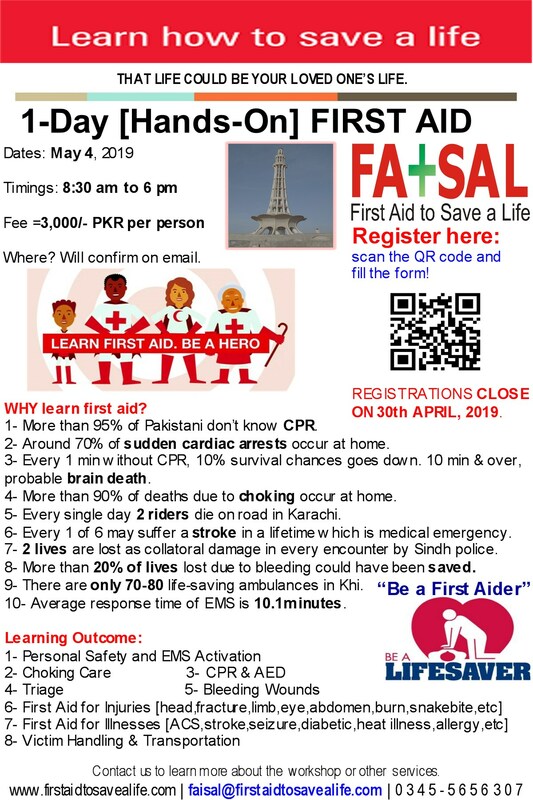 This entry was posted in First Aid CPR and AED and tagged accredited training program, AED, aed training, aed trainings in pakistan, American heart association, articles by dilaira dubash, automated external defibrillator, basic life saving skills, bite the bullet, control of bleeding and gunshot victim, control of bleeding and gunshot wound, cpr training, Crisis management, Crisis management: Bite the bullet, Crisis management: Bite the bullet By Dilaira Dubash, Crisis management: Bite the bullet By Faisal Javed Mir, emergency first aid, emergency first aid for gunshot wounds, first aid for gunshot wound, first aid for gunshot wounds, first aid required for gunshot wound, first aid to control bleeding, first aid training, first aid training courses in hyderabad, first aid training courses in karachi, first aid trainings in lahore, gunshot wound and required first aid, gunshot wounds and first aid, gunshot wounds and your reaction, how to stabalise a gunshot victim without wasting time, how to treat gunshop wound, how to treat gunshot victim, importance of response time while treating gunshot wounds, on-the-field surgical procedures for gunshot wounds, Special instructions to treat gunshot victim, sudden cardiac arrest, the express tribune, treating gunshot wound, use of tourniquit. Bookmark the permalink.